Do you have your Valentine's gifts nailed down yet? If the answer is no - and you are in the Sacramento area. This is the post for you. I've pulled together some great, local resources you need to check out if you haven't already. If you live midtown / downtown Sacramento area ... please, please, please check out Cookies & Milk. I mean, a cookie delivery service? Perfect for Valentine's Day. They all look so amazingly good and they have a specialty flavor of the week too - follow on social media to keep up with the flavors. And can I say, lucky dog to anyone who lives in their delivery area. Looking for something for the guy in your life? Check out Fit Face. A local, Sacramento brand of hip skin products for men. Totally worth checking out. They were one of the finalists in the Calling All Dreamers contest here in Sacramento. Go browse DISPLAY California over in Oak Park. I don't think I have ever gone in this place and not found something I wanted. It's a rotating pop up shop -- that has themes that rotate through. Always fun stuff to check out and very unique. Their own DISPLAY- APOLIS bag is a favorite of mine. 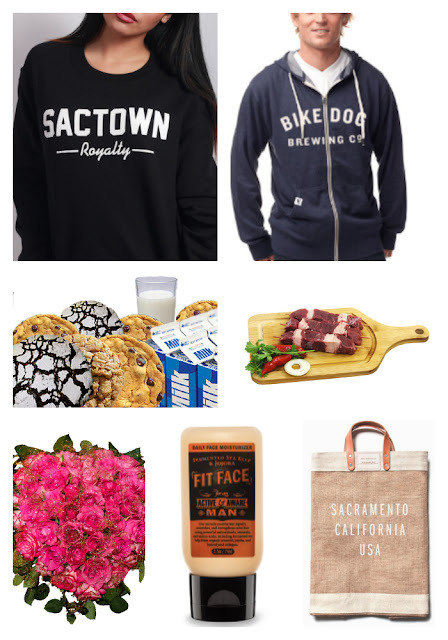 Local beer is always a nice gift -- and we have some great local brands in Sacramento. Bike Dog, Track 7, New Helvetia... and many more. Whole Foods always has a great selection of local beers you could mix and match. Or just go around to the breweries and get it yourself. You could always get beer merchandise too. We love the Bike Dog zip up hoodie. How about just a really nice dinner? You could visit your local butcher and get some amazing locally sourced meat. Um, yes I said local butcher. Go check out V. Miller Meats for something special to cook up. Or just head to your Farmers' Market and check out the selection of flowers and other local goods. You can find a schedule of all the markets in the area here.